Parents are more likely to talk to their little ones about having good manners and getting good grades than the importance of saving money, according to results of research recently published in Business News Daily. The same study found that parents generally wait until children are 10 or older before talking to them about the importance of saving. “Based on our findings, parents seem more concerned about the politeness of their children than their financial fitness,” said Ernie Almonte, CPA, vice chair of the American Institute of Certified Public Accountants’ National CPA Financial Literacy Commission, which conducted the research. Dollars and cents should get the same attention as ‘please’ and ‘thank you’ at home. Financial education builds critical skills that help put life goals within reach and strengthen the economy. Parents must make financial lessons a priority in both conversation and action as early as possible. For generations, parents have tried to teach their kids that, contrary to media messages and wishful thinking, money really doesn’t grow on trees. Today, parents need to stress these lessons at a younger age to counteract the onslaught of advertising for the latest gadgets, toys, and fashions targeted at younger audiences. Allowance? Start young – The earlier children learn basic financial principles, such as the exchange of goods and services for money, the better. 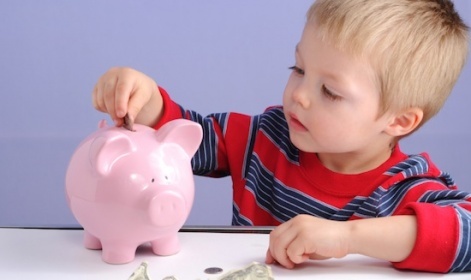 Children as young as age 4 can benefit from earning an allowance. (These littlest savers can learn to recognize coins, though they’re also more likely to lose them!) Make sure you tie allowances to chores. Base the amount the child receives on their age and needs. Will they be expected to purchase birthday gifts for friends, school lunches, or a trip to the mall, for example? If so, the allowance should cover those costs. Do not forget charity – Encourage kids to set aside a regular portion of their earnings and income for a good cause, such as church tithes or donations to non-profits. Such gifting will be returned to them many times over in terms of the character it builds. Have fun with it –Talking to teens, and getting them interested in proper money management, need not be all about spreadsheets and financial reports. Some parents use the classic game Monopoly to introduce kids to principles of earning, saving and spending money. Robert Kiyosaki’s Cashflow for Kids is another fun game to teach kids financial skills.Looking for a good place to start teaching your kids the value of saving? Instead of the usual bedtime stories, try reading them The Richest Man in Babylon by George S. Clason. It is a classic full of financial wisdom that will teach your kids lessons that can help them learn to be financially self-sufficient for life.